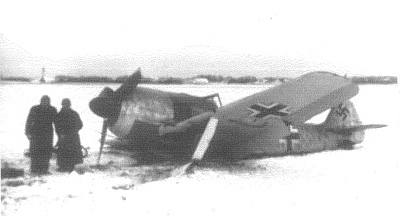 FW 190A-4/Y serial number 5548 damaged at Fliegerplatz Frederikshavn 11/1 1943. The aircraft belonged to 9./ JG 1 and was coded ? The FW 190 was damaged 20% during landing due to pilot error. Pilot Unteroffizier Heinz Born was injured.